Are you a go-getter? Self-described as ambitious, a hand-raiser or someone with excessive amounts of Pitta? We understand you. Type A personalities are characterized by their drive, aggression, competitive nature, impatience, and need for control. And while this is great for tackling that creative project or getting you to yoga on time, it can also prevent you from taking the time to actually chill. Enter the beauty of essential oils. Smell is a powerful tool in bringing you back down to earth when things get hectic. The combinations below are designed specifically for Type A personalities, or folks who tend to overwork themselves or fall headfirst into a pit of stress. Take a moment for yourself and inhale some scents to relax, rejuvenate, and tackle all that work with a fresh mind. Bergamot: known as “the oil of self-acceptance”, bergamot relieves feelings of despair, self-judgment, and low self-esteem, and can promote alertness and optimism. Tangerine: known as “the oil of cheer and creativity”, tangerine evokes qualities of joyfulness, is capable of lifting dark moods, and promoting a lightness of heart. These uplifting qualities of tangerine will assist with feeling overburdened by responsibilities. Eucalyptus: promotes optimism and self-confidence. When the days get rough, find solace in gratitude. Gratitude is an amazing tool for reframing your perspective, especially during times when you maybe feel “not good enough” or you’re stuck in a rut comparing yourself to others. It’s hard to remember how awesome you are when you’re Type A, but these combinations are sure to help. Your nose knows: citrus oils pack a big punch. Due to their chemical composition (made up mostly of a monoterpene component called limonene which has stimulating and enhancing effects on mood and cognitive health), they’re instant mood lifters. The scent of citrus oils like bergamot and tangerine are super helpful in turning a frown upside down. Suggested use: If you find that there is a particular set of circumstances in your life that seem to invoke frustration or a bleak mindset, probably the simplest way to intervene before the cycle of negative chatter begins is to keep a bottle of bergamot or tangerine nearby, and to simply take off the cap and inhale. This is aromatherapy at its simplest: no diffuser or mixing required. Just take a deep breath of the opened bottle. Using it in conjunction with a short mantra on gratitude can stem the tide of negativity. I frequently use either of the following when I need to re-boot my thinking: “You control the weather,” (to gain a sense of control over tempestuous emotions), and “You have what you need,” (to shift gaze onto the things for which I’m blessed). If you’d prefer to make a small roller bottle of these mood enhancers, you can use two-three drops of either/both citrus oil with a carrier oil, and for adult application, you can choose to add one or two drops of eucalyptus, whose cleansing properties have become known to ease tension, and whose clarifying scent tempers the wild aromatic rapids of citrus. Lavender: promotes emotional stability and renewal. Arborvitae: known as “The oil of divine grace”, arborvitae invites an individual to sacrifice personal will and ambitions for fulfillment. The mind relaxes and the soul experiences harmony and peace. Roman Chamomile: known for its anti-inflammatory properties, Roman Chamomile is calming and sedative. It is also thought of as a spiritual oil, assisting people to tap into and nurture their purpose. Find some time for calm, because all Type A personalities need a moment to just let it all go. When the stress starts piling up, find a quiet moment to inhale these essential (truly) oils. No calming blend would be complete without lavender, the chill-out champion over the centuries. When added to sedative Roman chamomile, they pack a placid punch. Arborvitae adds a woodsy magic that suffuses this blend with peaceful properties. Suggested use: In a 2ml amber bottle, combine 4 drops lavender with 2 drops each of arborvitae and Roman chamomile. Fill the rest with fractionated coconut oil (it’s always in a liquid format as opposed to the stuff in your kitchen), and use a roller top for easy application. Apply on pulse points and nape of the neck when you want to invoke calm or induce sleepy vibes. You can carry this small roller bottle in a purse, book bag or briefcase, which makes it convenient to apply right before you enter a stressful situation. This type of blend can do double duty in scenarios where more than one person needs chillaxing—such as busy parents with kids to wrestle into bed. Apply it onto your own temples and wrists to remain steady as the kids negotiate their way beyond bedtime boundaries, and then apply to the soles of little feet as you put on jammies, assisting their descent into sleepy time. Lemon – known as “the oil of focus”, lemon promotes discernment and foresight. It can restore mental energy, cognitive flexibility, and the drive to complete a project. *Rosemary – stimulates the mind and promotes alertness. Considered the “oil of knowledge”, rosemary brings expansion to the mind, supporting individuals in receiving new information, and is known to enhance memory. Eucalyptus – stimulates the mind and promotes alertness, clarity, and perspective. Suggested use: Before you get ensconced wherever you work, put two drops of each in a diffuser on your desk (or within 5 feet of you if you’re not a desk person). Within a few minutes, your space will be transformed into a focused zen den that will help stimulate mental activity. 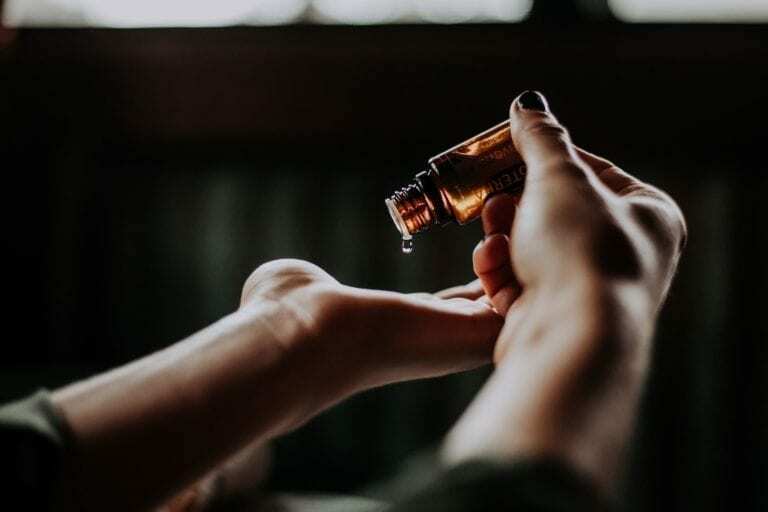 With continued use, the first hint of these invigorating oils will alert your cranium that it’s time to get down to business, and you just might drop your practiced procrastination routine more readily. If you would like to procure the oils mentioned above, click over here to Chop Wood Carry Baby and purchase the oils featured in this article!